Salmon Pasta Carbonara, a quick and easy midweek recipe that is ready in 15 minutes. 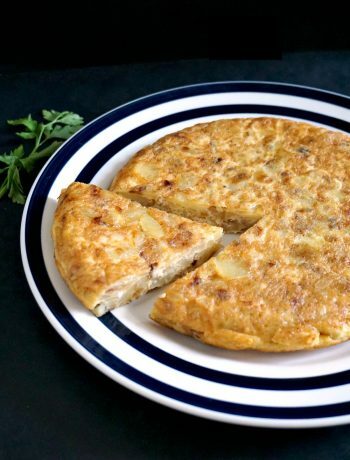 You only need a few simple ingredients to make a spectacular dinner. Why not a dinner date for Valentine’s Day? As tempting as a romantic meal for two in a 5-star restaurant is, you can always settle for the best homemade dinner date, and it can still be your dream date. This pasta carbonara ticks all the boxes, it’s quick and super easy, it’s fancy, and absolutely delicious. They say that love goes through the stomach, and it’s true. 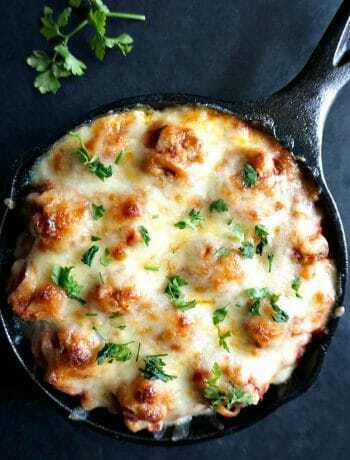 You’ll definitely impress your date with this Italian dish with a twist. The bacon carbonara is the more popular choice, but I always found that fish, and salmon in particular is a great choice for a posh dinner. You can replaced the baked salmon with smoked salmon, that’s absolutely fine. 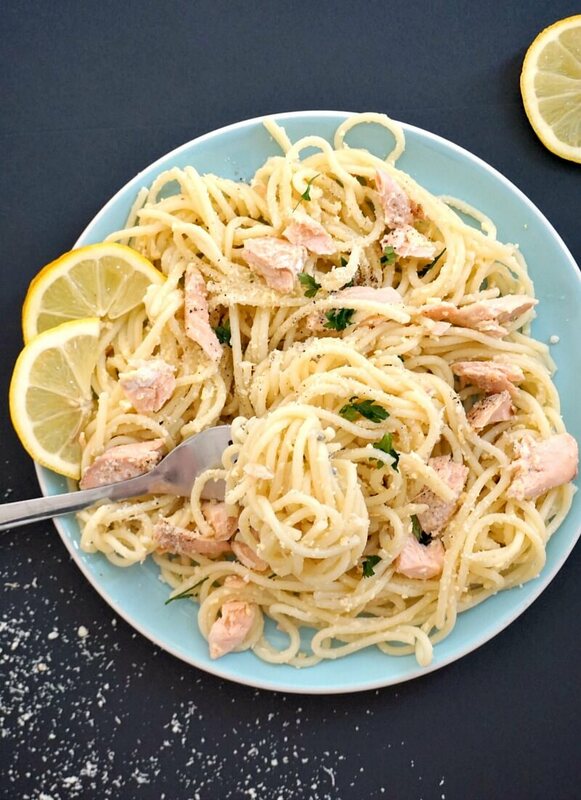 How do you make salmon carbonara? Pasta carbonara is one of the easiest pasta dishes you can ask for. All you need is cooked pasta, eggs and parmesan cheese. And nothing else. No cream, no sauces. The egg coats the pasta beautifully, and the parmesan gives that lovely sharp kick we need. I actually like to add tons of parmesan to it, but it’s up to you how much you add. Just cook the pasta according to the packet instructions, reserve 2-3 tablespoons of water it was cooked in, and drain the rest. Beat the egg with a pinch of salt and pepper, and half of the parmesan, and add it to the hot pasta. Note! Do not rinse the pasta after draining, we need it to be hot to cook the egg. Make sure the egg is at room temperature before adding it to the pasta. If the egg is cold, it might scramble. 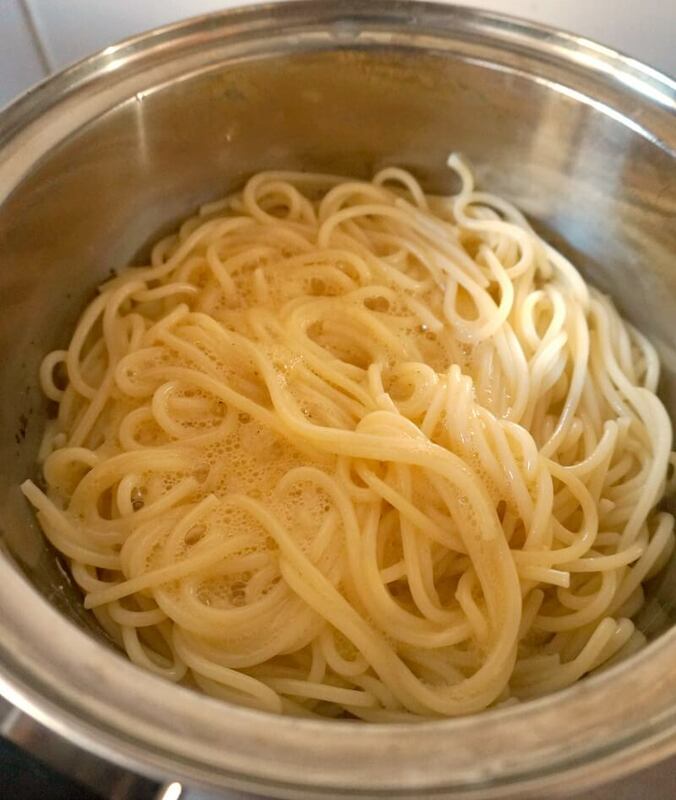 To be on the safe side, once you drain the water from the pasta, leave the pasta aside for about one minute, then add the egg mixture and reserved water. Mix well to coat, cook for a further 30 seconds or so, and add the remaining parmesan and cooked salmon. How do you cook the salmon? The salmon can either be pan-fried, or baked. I chose the baking option. It only takes 10-12 minutes in the oven. Squeeze some lemon juice over it, either before baking or after, and it’s all done. 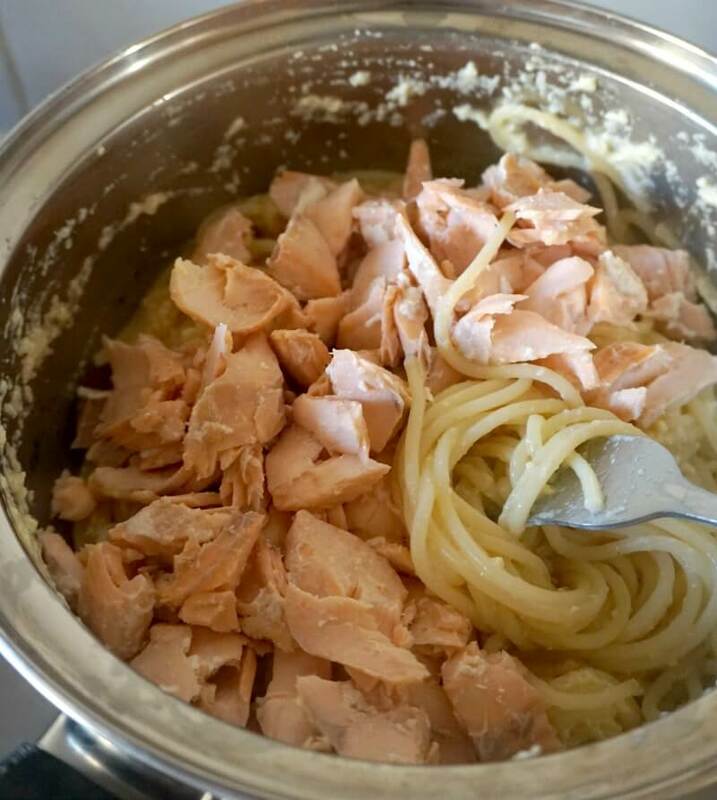 If you use smoked salmon, you can add it to the pan together with the egg mixture, so it can cook a bit, or just top the dish when you serve the pasta, and have it the way it is. 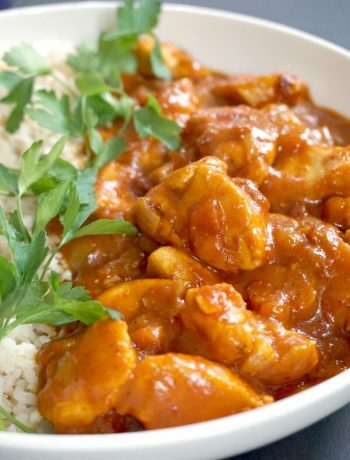 It’s a lovely dish, tasty enough to be served at special occasions, and quick enough to make a brilliant midweek dinner for the whole family. 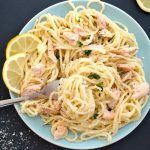 If you’ve liked my SALMON CARBONARA PASTA or any other recipe on the blog then don’t forget to rate the recipe and let me know how you got on in the comments below, I love hearing from you! You can also FOLLOW ME on FACEBOOK, and PINTEREST to see more delicious food and what I’m getting up to. 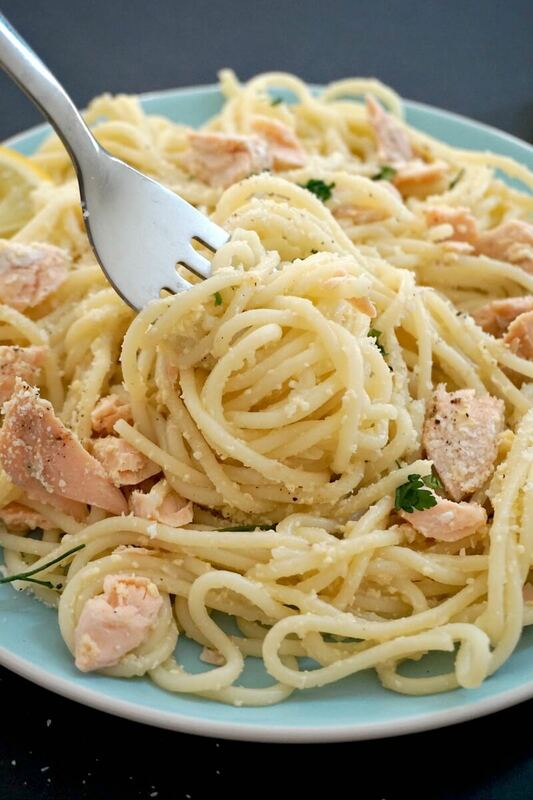 Salmon Pasta Carbonara, a quick and easy midweek recipe that is ready in 15 minutes. You only need a few simple ingredients to make a spectacular dinner. Why not a dinner date for Valentine's Day? Arrange the salmon fillets on a baking tray and bake at 200 degrees Celsius (390 Fahrenheit) for 10-12 minutes. Reserve 2 or 3 tablespoons of the water the spaghetti were cooked in, and drain the rest. Leave the pasta aside for about one minute. Beat the egg well, add half of the parmesan, salt and pepper, then add the mixture to the pasta together with the reserved water. Mix well, then add the flaked salmon together with the lemon juice, and toss well. Cook for a futher 1 minute, transfer to 2 plates, sprinkle over the remaining parmesan, then serve immediately.